Depiction of Saint Paul (left) in the home of Aquila and Priscilla. Priscilla (/prɪˈsɪlə/ Greek: Πρίσκιλλα, Priskilla) and Aquila (/ˈækwɪlə/; Greek: Ἀκύλας, Akylas) were a first century Christian missionary married couple described in the New Testament. Aquila is traditionally listed among the Seventy Disciples. They lived, worked, and traveled with the Apostle Paul, who described them as his "fellow workers in Christ Jesus" (Romans 16:3 NASB). Priscilla and Aquila are described in the New Testament as providing a presence that strengthened the early Christian churches. Paul was generous in his recognition and acknowledgment of his indebtedness to them (Rom. 16:3-4). Together, they are credited with instructing Apollos, a major evangelist of the first century, and "[explaining] to him the way of God more accurately" (Acts 18:26). They are mentioned six times in four different books of the New Testament, always named as a couple and never individually. Of those six references, Aquila's name is mentioned first three times and Priscilla's name is mentioned first on three occasions (as shown in italics in the list below.) This may indicate their equal status. Acts 18:2-3: And found a certain Jew named Aquila, born in Pontus, lately come from Italy, with his wife Priscilla; (because that Claudius had commanded all Jews to depart from Rome:) and came unto them. And because he was of the same craft, he abode with them, and wrought: for by their occupation they were tentmakers. Acts 18:18: And Paul after this tarried there yet a good while, and then took his leave of the brethren, and sailed thence into Syria, and with him Priscilla and Aquila; having shorn his head in Cenchrea: for he had a vow. Acts 18:26: And he began to speak boldly in the synagogue: whom when Aquila and Priscilla had heard, they took him unto them, and expounded unto him the way of God more perfectly. Romans 16:3: Greet Priscilla and Aquila my helpers in Christ Jesus. 1Cor 16:19: The churches of Asia salute you. Aquila and Priscilla salute you much in the Lord, with the church that is in their house. 2Tim 4:19: Salute Prisca and Aquila, and the household of Onesiphorus. The Christian Church, beginning with Jesus, had a radical view of the status of women. Jesus demonstrated that he valued women and men equally as being made in the image of God. Luke clearly indicates Priscilla’s "agency and her interdependent relationship with her husband. She is certainly not Aquila’s property - as was customary in Greco-Roman society - but rather his partner in ministry and marriage". Priscilla and Aquila were tentmakers as was Paul. Priscilla and Aquila had been among the Jews expelled from Rome by the Roman Emperor Claudius in the year 49 as written by Suetonius. They ended up in Corinth. Paul lived with Priscilla and Aquila for approximately 18 months. Then the couple started out to accompany Paul when he proceeded to Syria, but stopped at Ephesus in the Roman province of Asia, now part of modern Turkey. In 1 Corinthians 16:19, Paul passes on the greetings of Priscilla and Aquila to their friends in Corinth, indicating that the couple were in his company. Paul founded the church in Corinth. [1 Cor. 4:15] His including them in his greetings implies that Priscilla and Aquila were also involved in the founding of that church. 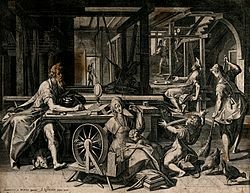 Since 1 Corinthians discusses a crisis deriving from a conflict between the followers of Apollos and the followers of Cephas (possibly the apostle Peter), it can be inferred that Apollos accompanied Priscilla and Aquila when they returned to Corinth. This happened before 54, when Claudius died and the expulsion of the Jews from Rome was lifted. In Romans 16:3-4, thought to have been written in 56 or 57, Paul sends his greetings to Priscilla and Aquila and proclaims that both of them "risked their necks" to save Paul's life. Tradition reports that Aquila and Priscilla were martyred together. Priscilla was a woman of Jewish heritage and one of the earliest known Christian converts who lived in Rome. Her name is a Roman diminutive for Prisca which was her formal name. She is often thought to have been the first example of a female preacher or teacher in early church history. Coupled with her husband, she was a celebrated missionary, and a friend and co-worker of Paul. While the view is not widely held among scholars, some scholars have suggested that Priscilla was the author of the Book of Hebrews. Although acclaimed for its artistry, originality, and literary excellence, it is the only book in the New Testament with author anonymity. Hoppin and others suggest that Priscilla was the author, but that her name was omitted either to suppress its female authorship, or to protect the letter itself from suppression. She is the only Priscilla named in the New Testament. The fact that she is always mentioned with her husband, Aquila, disambiguates her from different women revered as saints in Catholicism, such as (1) Priscilla of the Roman Glabrio family, the wife of Quintus Cornelius Pudens, who according to some traditions hosted St. Peter circa AD 42, and (2) a third-century virgin martyr named Priscilla and also called Prisca. Aquila, husband of Priscilla, was originally from Pontus  and also was a Jewish Christian. According to church tradition, Aquila did not long dwell in Rome: the Apostle Paul is said to have made him a bishop in Asia Minor. The Apostolic Constitutions identify Aquila, along with Nicetas, as the first bishops of Asia Minor (7.46). The fact is that women did indeed teach men, that women served as leaders, and that in doing so they enjoyed God’s blessing and won the praise of other believers. Priscilla instructed the learned Apollos, Lois and Eunice taught Timothy, and Phoebe is named as an overseer and a deacon in the church at Cenchrea. Furthermore, believers are enjoined to teach and to learn from one another, without reference to gender. Advocates of female pastorship perceive this as an imperative that was a reflection of cultural and legal restrictions of the day. They cite 1 Cor 11:11-12, where Paul writes "Nevertheless, in the Lord woman is not independent of man nor man of woman; for as woman was made from man, so man is now born of woman. And all things are from God" and his affirmation of Priscilla's instruction of the prominent evangelist Apollos as evidence that Paul was acceding to the law and customs of his day. One item of importance about the appearance is that they provide a chronological synchronism for the chronology of Paul's life. According to Acts 18:2f, before Paul meets them in Corinth, they were part of a group of Jews whom the Emperor Claudius ordered expelled from Rome; if this edict of the Emperor can be dated, then we would be able to infer when Paul arrived in Corinth. The evidence of other ancient sources points to two possible periods during the reign of Claudius: either during his first regnal year (AD 41; so Dio Cassius, Roman History 60.6.6), or during his ninth regnal year (49; so Orosius, Historia 7.6.15f). As a result, the experts are divided over when this expulsion took place: some, like Jerome Murphy-O'Connor, argue for the earlier year, while others, like Joseph Fitzmyer, argue for the later year. Priscilla and Aquila are regarded as saints in most Christian churches that canonize saints. The Orthodox Church commemorates them together on February 13, while other Orthodox Churches commemorate Aquila alone as an apostle on July 14. In the Catholic Church, the Roman Martyrology lists their feast as July 8. The Lutheran Church commemorates them on the same day along with Apollos. ^ Acts 18:1-3; Acts 20:33-35; Philippians 4:14-16. ^ Bruce, F. F. (1983). The Epistle of Paul to the Romans: An Introduction and Commentary. Tyndale New Testament Commentaries. Leicester, England: Inter-Varsity Press. ^ Suetonius mentions this expulsion of the Jews from Rome (Claudius 25.4), although he does not provide a definite date for this act; Tacitus mentions no such expulsion in his Annals although it is complete for the year AD 49. ^ "Name Days", In Touch 17.2, Feb. 2009. ^ Apostle Aquila on Orthodox Wiki.